So . . . just to be clear . 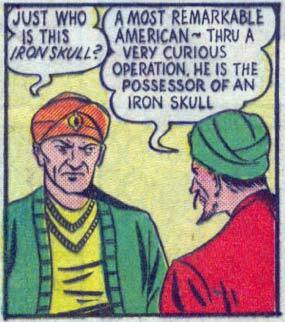 . . you’re saying that he has an iron skull, right? These guys must work for computer tech support. I think I am becoming the world’s biggest Iron Skull fan. Iron Skull vs Iron Fist vs Iron Man vs Iron Butterfly vs Pig-Iron vs The Metal Men vs Magneto vs Screw-On Head!!! Holy psychobabble, Batman! Where’s my pillbox? ?